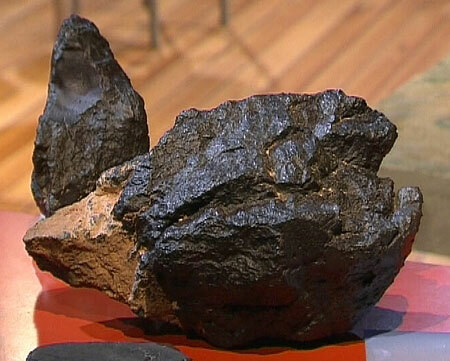 Twenty pieces of a single stone were recovered. In a hand lens dark chondrules are visible in a fine-grained matrix rich in silicates. The olivine is largely equilibrated (Fa 32.3), but pyroxene is more variable in composition. Cr-rich magnetite is ubiquitous, often accompanied by ilmenite and spinel exsolution lamellae. Minor sulfides include pentlandite and rare chalcopyrite. Evidence of shock is pervasive — olivine displays undulose extinction and opaque veins are frequently present. Occasional plagioclase- and pyroxene-rich CAIs with layered hercynite are present. Hammadah al Hamra is the second-most massive of the CK (Karoonda-like) carbonaceous chondrites. The CK chondrites are distinguished, among other things, by their abundant matrix (~75 vol%) and relatively high degree of oxidation. Unlike the great majority of carbonaceous chondrites, most CK chondrites have been metamorphosed to petrologic type 4 or higher.